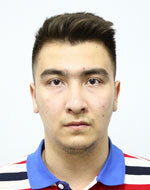 Alisher Saduov was born in Kokshetau city, Aqmola region. Graduated from Nazarbayev Intelectual School in 2014. Currently, 4th year student studying geology and geophysics. The president of Society of Exploration Geophysicists 2016-2017. Particpant of geophysical field camps in Russia, Perm and Altay region, Novosibirsk. I was in internship at Sazankurak oil field in Atyrau region, and Karakudukmunay oil field in Mangystau region. Currently, there are many methods of modern interpretation of magnetic survey data for determination of geological structures and their shape, depth of occurrence. As an example, the area where the detailed magneto-prospecting was carried out was chosen, by Chu-Ili party in 1978-1981. To interpret the data in the study area, the following methods were used: reduction to the pole, horizontal and vertical derivatives, upward and downward continuation, low and high frequency filters. The results of a comparison between interpretation data and data that were obtained by observations of scientists were demonstrated, and as a result, it was revealed that the data of both maps practically coincide with each other. Thus, it is proved that these methods of interpretation of magnetic prospecting are effective in the detection of geological structures.